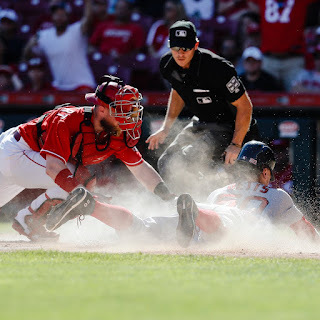 The Red Sox rallied for four runs in the eighth inning in a come-from-behind 5-4 win over the Cincinnati Reds at Great American Ball Park on Sunday afternoon. With the Yankees losing to the Blue Jays, Boston's Magic Number to clinch the American League East pennant is down to three. Mookie Betts did most of the damage in the eighth with a bases-clearing double. Betts would later score what proved to be the winning run (pictured) on an infield single by Rafael Devers. Doug Fister started for the Red Sox and went 5.1 innings in the no-decision. He allowed three runs on nine hits while striking out nine. Robby Scott was the winner in relief and Craig Kimbrel picked up his 35th save. Devers had two hits, including a solo home run in the fifth, to lead the Red Sox. The win was Boston's sixth in a row as they look to seal the AL East for the second consecutive season.